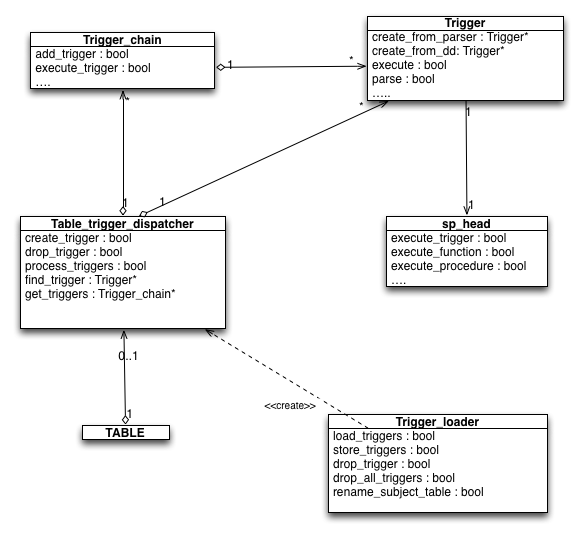 MySQL developer's blog: Support for multiple triggers per table for the same value of action/timing. For a long time MySQL server supported only one trigger for every action (INSERT, UPDATE, DELETE) and timing (BEFORE or AFTER). In other words, there could be at most one trigger for every pair (action, timing). It means that a user couldn't assign for example two BEFORE INSERT triggers for the same table t1. To workaround this restriction and allow several actions to fire on some table event, a user had to implement several stored procedures (one for each activity that would be implemented as independent trigger), create trigger for a table and call this stored procedures from the trigger. As of MySQL 5.7.2 this limitation has been removed. It means that starting the MySQL 5.7.2 a user can create for example, two BEFORE INSERT triggers, three AFTER INSERT triggers and four BEFORE UPDATE triggers for table t1. And this triggers will be called in the prescribed order determined (in generally) by the sequence in which triggers were created. In the implementation of multiple triggers per table the main point was the order of triggers execution. In according with SQL-standard 2011 the order of execution of a set of triggers is "ascending by value of their timestamp of creation in their descriptors, such that the oldest trigger executes first. If one or more triggers have the same timestamp value, then their relative order of execution is implementation-defined". To follow the standard it was introduced new column 'ACTION_ORDER' of INFORMATION_SCHEMA.TRIGGERS that takes the ordinal activation value. Also the attribute 'CREATED' of INFORMATION_SCHEMA.TRIGGERS that was supported by server before 5.7.2 and was always NULL now stores the trigger creation timestamp. The value of the attribute CREATED is set at the trigger creation time and can not be changed afterwards (the only way to change it is to drop and re-create the trigger). The attribute ACTION_ORDER is a positive integer. As you can seen the numeration of attribute ACTION_ORDER is independent for every pair action/timing. Replication should preserve ACTION_ORDER and CREATED attributes. Since CREATE TRIGGER statements are logged in the order user entered them, then ACTION_ORDER is preserved. Attribute CREATED is pure informational attribute. Its values isn't take into account during triggers execution. mysqldump doesn't preserve trigger creation timestamps. Replication preserves CREATED attributes. and during execution of statement 'INSERT INTO t1 ..." triggers will be executed in the order t0_bi_0_1, t1_bi, t1_bi_1, t1_bi_2. To support persistent storage of creation timestamp for triggers the new attribute 'created' was added to the TRG file. This attribute contains a list of timestamps for every trigger assigned to the table. As of 5.7.2 this message isn't appear any longer. The error message itself (ER_NOT_SUPPORTED_YET) will of course remain. 21 new MTR tests were added during implementation of new functionality. These test are public and reside in mysql-test/t/trigger_wl3253.test and mysql-test/suite//rpl/t/rpl_trigger.test. Implemented changes were covered for 89.7% by these tests. Implementation of triggers support was significantly refactored during adding support for multiple triggers per table for the same action/timing. The figure below depicts the major classes involved in support of triggers in MySQL server. Main activities related to triggers can be categorized as loading triggers from Data Dictionary, handling statement CREATE TRIGGER and executing triggers assigned to a table. Lets describe in short every of this activities. For every unique pair action/timing for that triggers were loaded from Data Dictionary an instance of Trigger_chain is created. The method Trigger_chain::add_trigger is called for every trigger with the same action/timing value. Check whether an object of TABLE has initialized pointer to a instance of Table_trigger_dispatcher. Create instance of Table_trigger)dispatcher if it is not. Check whether there is an instance of class Trigger_chain for event/action time specified in the statement CREATE TRIGGER. Create new instance of class Trigger_chain if not. In result of every step described before there is an object TABLE that points to an object Table_trigger_dispatcher. An instance of Table_trigger_dispatcher contains a set of objects Table_trigger_chain that in turn contains a list of Trigger to execute. If there is an object Table_trigger_chain for specified value pair ACTION/TIMING then the method Trigger_chain::execute_triggers is called to execute every trigger in the list of triggers assigned to the TABLE. "The error message itself (ER_NOT_SUPPORTED_YET) will of course remain." Why? Am I missing something?